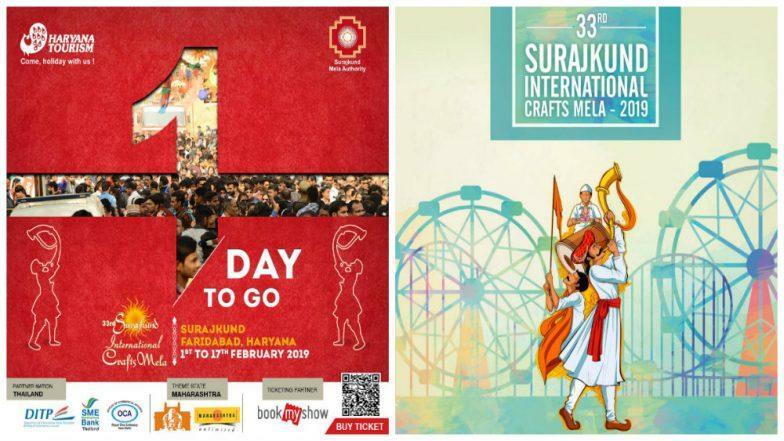 Chandigarh, January 31: The 33rd Surajkund International Crafts Mela 2019 will begin from February 1, 2019, and will last till February 17. The preparations for the festival are in full swing, and Surajkund is ready to host the country as well as the world once again for the grand Mela (fair). This time, a selfie point has also been installed by the event organisers. The purpose behind doing so is to ensure that visitors go back with fond memories from the Mela, as well as for safety purpose. Kala Ghoda Arts Festival 2019 Dates: Full Schedule, Workshops, Seminars to be Held Over Nine Days at the Mumbai Event. The Surajkund Mela authority organises the Mela along with Haryana Tourism. The Union Ministry for Tourism, Union Ministry for Textiles, Union Ministry For Culture and External Affairs Ministry participates in hosting the fair as well. Just as the festival has a Theme state, it also has a Partner Nation. The Partner Nation this time in Thailand. The Mela provides a platform to artists from various genres, with national and international folk artists presenting a variety of performances. The Mela is a heritage that represents the best of cultures. The cuisine provided at the Mela is extremely popular with the tourists and visitors alike. The festival aims to promote handicrafts, handlooms and such other indigenous craft works. This year, the rich culture, heritage, cuisine and other aspects related to Maharashtra will be on display at the 2019 Surajkund crafts festival.